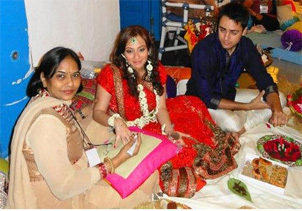 Usha Shah is most glamrous mehendi artist in the bollywood. Many major bollywood divas like Kajol, Sangeeta Bijlani and Grooms like Hrithik Roshan, Jackie Shroff, Ajay Devgan have experienced the art of Usha Shah. Due the intense love of mehendi art, she had reached to height of fame and glamour. The Rotary Club of Bombay Downtown had already honored her for Professional excellence in mehendi art. She became popular in in the year 1985, Namrata Dutt got so much impressed with usha shah's post in Namaskar magazine and open the opportunity for usha shah to show her talent. She had also given the contribution to media world also.